Random thoughts: I found this at Trader Joe's as part of a Unibroue variety pack. The label artwork makes me want to drink it on a dark stormy day. A few months ago, I tasted La Fin Du Monde and gave it a 5 star rating. It's an amazing beer! The tasting: Dark brown in color with a thin white head that dissipates quickly. I noticed some re-fermented yeast sediment floating around as well as champagne-like effervescence. Aroma of plum, raisins, tobacco, clove, yeast, and alcohol. Flavors mirror the aroma, with the addition of molasses. Trois Pistoles is medium bodied and highly carbonated. A mild fruity sweetness and alcohol are present in the middle. 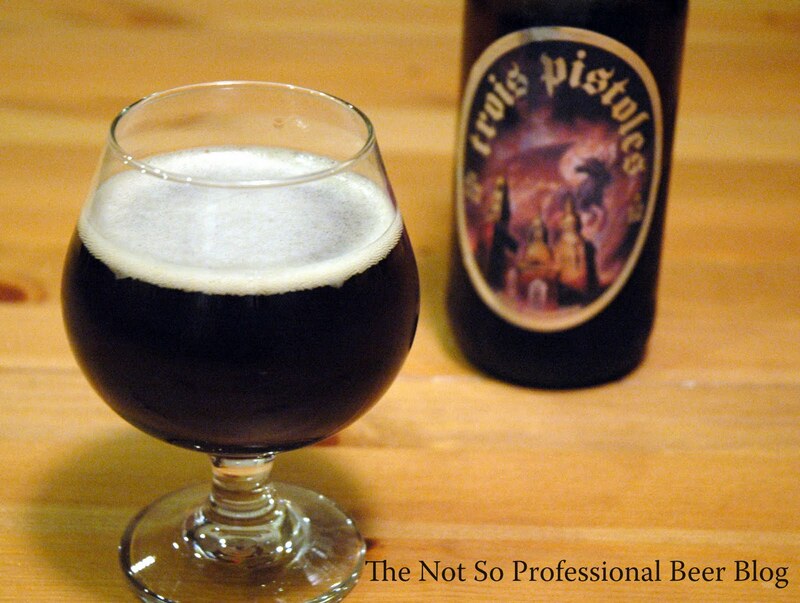 It finishes dry with flavors of plum and lingering alcohol. Rating: 2 star. Drinkable, but not sure I want to. I had a hard time finishing this beer. The flavor combination (particularly the tobacco and alcohol) didn't work for me. 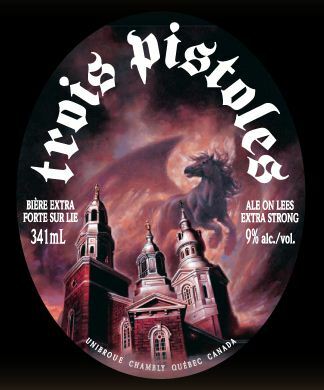 If you plan to dismiss it, know that Trois Pistoles is VERY HIGHLY rated on Beer Advocate and RateBeer. For what it's worth, the other beers in the variety pack are well worth the price of admission. 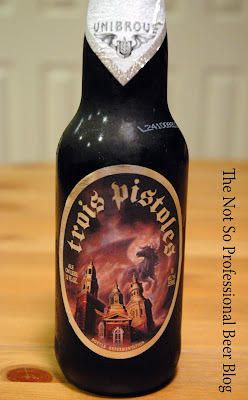 Have you tried Trois Pistoles? Tell me what you think. I've been a fan of the Unibroue(of Quebec)beers long before the brewery was bought by the Japanese Sapporo as part of their dastardly plan for market share. Sleeman brewery ( of Ontario) was also taken. The purpose was to gain access to the provincial beer distribution cartels and distribution systems. Now the formulas for the Unibrou brews are being neutralized to gain a broader market appeal and in my opinion the flavor has changed and is less complex . By far my favorite of the Unibroue family. Not to say that others are sub-par, the brewery is by far my favorite in the New World. La Fin du Monde is amazing. Ephemere is great and Chambly is awesome. Give Unibroue a try if you enjoy complex beers with a broad, strong palate and content. I like the cases, because only true enjoyers will ask for a second, and not too many of my friends are drinkers for the experience. They drink for the buzz and easy drinking. At 9% there is definitely a buzz, but not many can handle the complex palate. Highly recommended tho. Esp with a dinner.